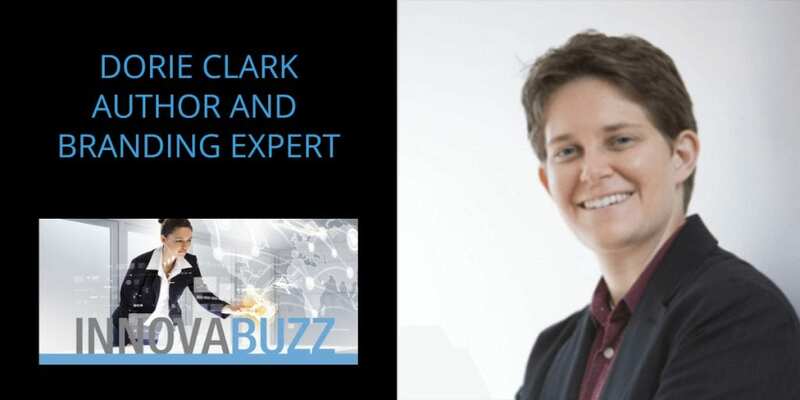 In this episode number 15 of the InnovaBuzz podcast, Dorie Clark, author of “Reinventing You” and “Stand Out” shares with us, ways each of us can stand out and be recognized experts in our field. She includes in her list of clients impressive companies like Google, Microsoft and the World Bank plus Morgan Stanley, the Ford Foundation, the Bill and Melinda Gates Foundation. View the interview to learn from the information Dorie shared with us. Today, I’m giving away a copy of Dorie’s first book which is called “Reinventing You, Define Your Brand, Imagine Your Future”. Leave a comment under the video and tell us what you’ve done to reinvent yourself, how you’ve gone about that, what your experience has been and, also, what success you’ve had. It was from that personal experience of having so many doors shut in her face and having to embrace change many times, that Dorie wrote the book, Reinventing You, for people who want to change careers or who feel like, in some way, their full talents aren’t being recognized. The book provides a toolkit for the reinvention process. In her new book, Stand Out, she dedicates a whole section on how to make yourself “luckier”. The main premise of Stand Out is that in today’s world of the internet and “open publishing”, there is so much noise that it is hard to get your message across. Stand Out reverse engineers the process by which people have become experts in their field and got their ideas to stand out. Entrepreneurs need to find ways to leverage their capabilities, because there comes a time for everyone, where you can’t do “it all”. You can be the best thinker in the world, you can have the best ideas in your head, you can be the most insightful consultant, accountant, lawyer, web designer or whatever it is, but, if you do not put your ideas out there and communicate them to other people, no one will ever know if you’re any good. You have to have a strong opt-in email list of people, community that wants to hear from you. Here are Dorie’s answers to the questions of our Innovation round. Watch the interview to get the full scoop. #1 thing to be more innovative – Training across disciplines, bringing in insights from different disciplines is something that I would really recommend as a spur to innovation and creativity. Best thing for new ideas – Read lots of good books and articles. Favourite tool for innovation – books! Keep project / client on track – A good project management tool if you are tracking something that is complicated, that has multiple people, that has multiple deadlines. Differentiate – Content creation – put your ideas out there and communicate them to other people. You have to be talking about them, giving speeches, doing webinars, doing podcasts, writing blogs. You can reach out and thank Dorie via Dorie Clark’s Website or her Facebook Page and Twitter. Note that Dorie’s website has over400 free articles with a lot of information for perople interested in personal branding or reinvention. Dorie suggested I interview Judy Robinett who is the author of a book called “How to Become a Power Connector” and a networking maven. So, Judy keep an eye on your Inbox for an invitation from me, for the Innovabuzz Podcast! Hint: To enter the competition, leave your comment underneath the video. Tell us about what you’ve done to reinvent yourself, how you’ve gone about that, what your experience has been and, also, what success you’ve had. Hi, I’m Jürgen Strauss from Innovabiz. Welcome to Episode No 15 of the InnovaBuzz Podcast – designed to help smart businesses with an interest in innovation and the Internet of Things become even more innovative. In this episode, my guest is Dorie Clark, author of the books “Reinvention You” and “Stand Out”; she’s also a marketing and branding expert, speaker and lists amongst her clients impressive companies such as Google, Microsoft, the World Bank, Morgan Stanley as well as the Ford Foundation and the Bill and Melinda Gates Foundation. Dorie is a very impressive individual and she was very giving on the interview, sharing a lot of great tips on how each of us can stand out and differentiation ourselves. We talked about content creation and the need to get your ideas and thoughts “out there”, in other words, published, so that people know what you know! We also talked about email lists, nicheing, specialization, at the same time being versed or trained across multiple disciplines as well as a whole lot of other cool stuff. This is a fascinating interview, so get ready to be inspired! Before we meet Dorie, a quick competition announcement – this week’s competition prize is a copy of Dorie’s first book “Reinventing You, Define Your Brand, Imagine Your Future”. Stick around for details on how you can enter the draw to win that competition prize later on in the interview. So let’s get into the Innovation Hive and get the Buzz from Dorie Clark. Jürgen: Hi. I’m Jürgen Strauss from Innovabiz. Welcome to this episode of the InnovaBuzz Podcast. Today, it’s my great privilege to have with me Dorie Clark, all the way from New York City in the US of A.
Dorie is a speaker, a marketing strategist. Let me just have a look over here what else you’re saying on your web page. I mean, there’s pages of things here. She’s basically a really high achiever from a very early age. We’ll hear a lot more about that later. Welcome to the Podcast, Dorie. Dorie: Jürgen, thank you so much. Great to talk with you today. Jürgen: Yeah. It’s a privilege to have you here now. We’ll talk a lot more about all the things you’ve been up to. I think, at the Duke University Fuqua School of Business, you’re an adjunct professor. Is that your main activity? Dorie: It’s one of the main activities. I do that and I give a lot of talks, I travel pretty frequently for that, and then writing books, including the one that we’re going to talk about, my new soon to be released Stand Out, How to Find Your Breakthrough Idea and Build a Following Around It. Jürgen: Yeah. I’m looking forward to hearing a little bit about that. I see it’s posted on Amazon, but not due for release until about mid-April. Jürgen: Now, your list of clients also is a very impressive list. It includes Google and Microsoft and the World Bank and, who else do we have there, Morgan Stanley, the Ford Foundation, the Bill and Melinda Gates Foundation. That’s very impressive, so I look forward to hearing about how you get involved with clients like that because I’m sure our guests are keen to provide services to those sort of clients where they can add value. Before we learn more about Dorie and all those things she’s been up to, I’d just like to announce the competition prize today. It is, in fact, Dorie’s first book, which is called Reinventing You, Define Your Brand, Imagine Your Future. It was published in 2013. It’s been translated into Russian, Chinese, Arabic, French, Polish and Thai. I don’t know if that’s up to date. There might be more languages now, but it’s obviously a very successful book and it’s good wide appeal, so stay tuned. Later on in the Podcast, you’ll find out how you can enter the draw to win that prize and read that fabulous book. Dorie, I noted in your resume in the back page that you were pretty ambitious very early on. You went into a special program for gifted children at the age of 14 and I think at the age of 18 you’d already graduated from college and at the age of 20 you had a master’s degree in theology. That’s pretty impressive. I’m interested to hear, at a very early age, as a young child, what you actually had a in mind to be when you grow up. Dorie: Actually, my first love, my first hope was to be an academic. I wanted to be a literature professor because, when I got to college, the professors were the folks that I really admired. They had cool jobs. They were big thinkers. They got paid to read books and think about things and talk about them with people. I thought that was the best ever, so I really wanted to try to emulate that. Unfortunately, actually, after I finished my master’s degree in theology and I applied to doctoral programs, I actually got turned down by all of the doctoral programs that I applied to. It was just like a slap. I was, like, “Oh, no, I don’t know what to do.” I had to figure it out. I ended up getting a job as a political journalist, which was a good sort of second choice. I was interested in that. I like writing. I like politics. That could have been good, but, unfortunately, I entered the world of journalism at just about the point where journalism was collapsing. A year into my career, I got laid off. That didn’t work very well. Then, I decided, okay, I like politics, maybe I’ll work in politics, and I got recruited to be the press secretary on a gubernatorial campaign. That candidate lost, and then I got to be spokesperson on a presidential campaign, which was even cooler. That candidate lost too. It took me a long time in my 20s to actually find a career. I had to keep reinventing myself. Now, a decade-plus later, I’ve had the opportunity to do a lot of cool things. I mean, I teach for business schools. I give talks. I write books. It was a real process getting there. I learned a lot in the course of reinventing myself. It was from that personal experience of having so many doors shut in my face and having to try to come up with new answers that I wrote a book, Reinventing You, for people who want to change careers or who feel like, in some way, their full talents aren’t being recognized and that they want to find a way to change their brand and change how they’re viewed by other people. Jürgen: Was there a specific pathway you had with all those changes, or did you just sort of grab at the opportunities that came up and then realize that there was actually a process that you could write about and teach others about? Dorie: Certainly, living it out, there was not a grand plan. It was me sort of muddling through blindly and going from one thing to the next, which I think is how a lot of us had all careers for better or for worse. It was only afterwards, it was post facto, through the course of evaluating my own experiences and then interviewing dozens and dozens of professionals who had successfully made career transitions that I was able to determine that there are patterns. There are things you can do that are useful strategies that can hasten your reinvention, and so, to spare people the kind of mumbling that I did, I wanted to write Reinventing You so that I could distill some of the best practices and, hopefully, give people a little bit of a toolkit so that, if they read this, their reinvention process can go better and faster. Jürgen: Of course, I think you talked about mumbling through as you lived it, but I think there’s a lot that the unconscious mind actually controls. If I reflect back on some of the things that I’ve done and I think, “Wow, there are some things that are, in hindsight, brilliant strategic positioning decisions, but they weren’t made on an assessment of the strategic position and so on.” It was kind of like, “Okay, I think I’ll just do that,” and, in hindsight, it turns out to be a brilliant strategic decision. I wonder how much of that is because you’re clear on the things you really value and the things that means something to you and the things that you can contribute to others that the unconscious mind then just takes over and says, yeah, that’s the way to do it. Dorie: Yeah. Absolutely, a lot of things, a lot of our decisions really do turn out to be luck where we come in to things, serendipity. In fact, in my new book, Stand Out, I actually have a whole section on how to make yourself luckier, which might sort of sounds like an oxymoron. Like, how could you possibly do that? The definition of luck is that it’s this random chance happening. It actually turns out that a lot of researches indicating that luck, in a lot of ways, is less about happenstance that you might imagine. There was a gentleman who wrote a book called Heart, Smarts, Guts, and Luck. His name is Tony Tjan. He’s a friend of mine, who wrote this book with a number of other coauthors. What they did was they conducted a survey of thousands of entrepreneurs to determine what makes an entrepreneur successful. They determined that these four characteristics, what they called heart, smarts, guts, and luck, were the critical factors and that every entrepreneur kind of falls into one category or another. The other one makes sense. I mean, you could think, oh, okay, some entrepreneurs are brainy and some entrepreneurs are gutsy and some have a lot of passion, but then you look, and about a quarter of entrepreneurs are luck-driven. That might sound ridiculous, but it turns out that really what this is – is that these are people who are generally more laid-back, they’re more open to experience. They’re less sort of driven in a Type A fashion where it’s always, “What am I getting out of this experience? What am getting out of this conversation?” and they’re willing to just sort of see what happens. It’s that kind of attitude of humility and curiosity that actually, later on, people label as luck. Jürgen: Yeah. Yeah, that’s a really good point because we talk a lot about innovation on this Podcast. I think a lot of innovation comes around people being curious, people being open to new experience, so curiosity and enthusiasm. Passion comes into it, but it’s all about being open to that new experience. Jürgen: I guess the door opening maybe lucky, but going through it and then taking the opportunity that’s presented is probably less lucky. That’s a conscious decision. Dorie: Yeah, you got it. Jürgen: Going back to your childhood again, I’m fascinated because my two kids, one is about to be 30 and one in his early 30s, were very gifted children early on. That presents quite a few challenges to parents of gifted children. I’m sort of interested to hear your side of it, from somebody else. When did you realize you were different to other kids and how did you handle that? It’s something that I don’t really wave a big flag about “giftedness” because, in a lot of ways, I don’t even think it’s really apt. I mean, you see movies or you read books about people and they’re doing these crazy physics equations when they’re 10 and things like that. That’s not what I was doing. I thought of myself as being somebody who was a mature person. I was mature very young I think largely because I had older parents and I didn’t have any siblings, and so my peer group was like 40 years older than me or 50 years older than me. When that’s your peer group, it’s not cool to make stupid, idiotic jokes like a lot of little kids do. It’s like you have adult conversations. I learned about that and I became comfortable with that. I was always more comfortable dealing with people who are older than me. That was something that just has sort of stayed the same throughout. I think, sure, yeah, I was intelligent enough, pretty intelligent, but, mostly, I thought of it as a function of maturity and also drive because I grew up in this little town in North Carolina and there’s a lot of people that might be very smart, but they don’t have a drive to go to college early because they like where they are, they like their town, they like their friends, things like that. I was, at various points in my childhood, fairly lonely. I didn’t really like my friends that much. I certainly didn’t like my town that much. I felt a desire to get out of there, and so I thought, “College, that sounds like a great idea. Bring it on.” I was actually very keen to do it. That seemed like a good escape for me. Jürgen: Yeah. Yeah, that’s fascinating because, like you say, from my own experience as a parent of children that were classified as gifted, it was a case of we’d always treated our kids even right from birth, no gogo, gaga stuff, so we talk to them as people. Jürgen: We started reading to them very early and got to reading sophisticated books quite early. It’s a little bit of the same thing. You put them in an environment where they’re exposed to more mature stuff and then they become more mature. They’re both still are very down-to-earth and very humble, which we think is great. Dorie: Yeah. Yeah. Yeah. I’ve certainly heard it. That’s a common thing. I wasn’t really doing that necessarily, but I’ve heard it. That’s a common response. Jürgen: Yeah. Okay. Tell us some of the exciting things that have happened since then, since you’ve come out of college and went through that transition period of reinventing yourself several times as a journalist and a political advisor. Dorie: Yeah. Yeah, so I did have a lot of sort of front-loaded adventures when I was younger. Yeah, for the past 9 years, I had my own consulting business. I’ve been an entrepreneur, which has been fantastic. I really think it suits my personality quite well. As part of that, I do a slew of different things. The variety is exciting for me. As I mentioned, I teach for Duke and a number of other business schools. I write books, including Stand Out and Reinventing You. I blog pretty frequently for Harvard Business Review, for Forbes, for Entrepreneur, for Time Magazine. I give speeches. I actually just got back yesterday from giving a talk in Texas. I do a little bit of executive coaching, and then I do marketing strategy consulting for corporations. Jürgen: Yeah. Okay. That’s a pretty wide gamut. Is there time for anything else in there, like some, I don’t know, some social time or hobby time? Dorie: I work a lot. I definitely won’t deny it, but, yeah, I love to read. That’s probably my favorite – and so I read. There’s a lot of talk in business circles these days about having a low information diet and that it’s better not to read the news or things like that. As a former journalist, I love the news. I’m sort of obsessed with the news, so I read the paper almost cover to cover every day. That’s a very relaxing thing for me. I love reading high-quality magazines like The New Yorker, Fast Company or Inc. or Wired or things like that. That’s really fun. I love going to lectures. There’s interesting talks at a club that I belong to. Whenever there’s a kind of cool speaker, I’ll go see that. A couple of weeks ago, I went to one about Oscar Wilde. He gave a lecture tour in America before he got really famous. It was like the very early days of Oscar Wilde when he was sort of honing his personality and his rapier wit. We got to hear about what young Oscar was like. That was really cool. Jürgen: It sounds fascinating. I saw a TEDx talk that you gave, I think, last year. Jürgen: Yeah. That was pretty impressive. We’ll post the link to that one so that the audience can, perhaps, visit that one and just hear a little bit more about some of the things you talked about. I think the topic there was the innovation and about your new book launch, if I remember rightly. Dorie: Yeah, exactly. It was called How to Find Your breakthrough Ideas. That was drawing on a lot of the concepts that I write about in Stand Out. Jürgen: Okay. Is there something that keeps you awake at night and you worry about? Now, for the second one, I have a much clearer idea of what I should be doing, and so, then, it just sort of weighs on like a ton of bricks because you realize there’s many things that you should be doing that you probably haven’t been. I’m trying hard. I want to launch this book as strong as I can. I want to launch it into the world so that I can make a good impact, so I’m trying assiduously to do it, but I’m constantly worried I’m not doing as much as I could. Jürgen: All right. Tell us a little bit about the book and what you talk about in it enough to generate some interest with the audience. We’ll post a link to the Amazon bookstore there where you can pre-order it. Dorie: Yeah. Thank you, Jurgen. I appreciate it. Basically, the idea of Stand Out is that we live in kind of a changed world these days because what used to be the problem was that you needed to get past the gatekeepers in order to be able to present your thoughts and your opinion. Now, of course, as we know with the rise of Podcast like this or blogs or things like that, there’s no gatekeepers anymore. Everybody can get their ideas out there, which is phenomenal. It’s a wonderful thing, but the problem has moved down the pike. The problem now is, okay, now that everyone is communicating, now that we live in this sort of noisy world, how do you get your idea to stand out? How do get it noticed by people? You can say, and that’s great, but it doesn’t do a lot of good if no one is tuning in or if no one is really paying attention. How do you break through and actually get people’s eyes on you. That’s the premise of the book. What I did was I interviewed about 50 top thought leaders in a variety of professions, everything from business to genomics to urban planning to real estate technology and tried to figure out among these most successful people what it is that they were doing in order to be able to break out. 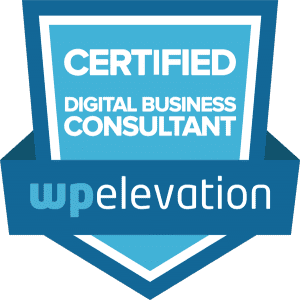 I tried to reverse-engineer the process by which they became a recognized expert so that I could then help regular people figure out how to do that for themselves. Jürgen: Okay. That sounds fabulous. Yeah. I’m a big fan of process and making sure you structure things so that you know that you’re following a path that somebody has developed or modeled and that’s really a good way to fast-track to success. I’m really looking forward to read the book and find out more. Dorie: Yeah. Thank you. You’re going to appreciate it. Jürgen: What do you see as the biggest challenge that you face in all of the activities you’ve got on in your business? Dorie: The biggest challenge that I face is probably, like right at the moment, time management. I think a lot of professionals probably would say the same thing. I get an enormous number of emails, meeting requests, things like that and so, actually, I’m working hard. I’m trying to put in place systems to help me with that because I know that, even in the short term, it means more work, you really need to make that effort so that you can be successful in the long term. For instance, one of my goals, which, sometimes, things don’t work out the way you want, is I try to get teed up to have a full-time virtual assistant in place by last week, by the beginning of March. Anyway, I went through the process. I did the interviews. I did the sourcing, et cetera. I hired somebody, and she started. She worked for me for a week. I had to fire her after a week because she was just absolutely not good. I couldn’t trust her work. I couldn’t trust her to get things done when she said they were going to get done. I figured, if it’s like this in week 1, it’s not going to get better from here, so we let her go. I’m in search again, so I’m trying to get that happening. Now, I actually have two different VAs that I work with for sort of discrete tasks and part-time work. You need to figure out ways to leverage your capabilities because, at a certain point, you just literally can’t do it all. It’s not a question of prioritization anymore. It’s just you, literally, can’t do it. You have to get another set of hands to help you. I’m trying to do that in a smart way. Even though it takes longer than you want, I think, in the end, it’ll be helpful. Jürgen: Yeah. That’s great advice because I remember, when I first got my first team member on board and started handing off some day-to-day tasks, how liberating that was. In particularly, like we spoke before the interview that I’ve actually spent a few days in the hospital last week because I had a little bike accident. One of the really comforting things about when you’re faced with a situation like that is knowing that the work for the clients is going on and it doesn’t stop because I’m stopping. Also, the nicer part of that is I can spend three days in the hospital and don’t worry about getting well, but I can also take three days at some time and go and do some holiday-type activities away from work. Dorie: Something more fun than a hospital. Jürgen: That’s right. Knowing that there are other people that continue to work or take activities and then I can focus on where I add most value, which is what you are talking about as well, choosing to spend time on the things that add the most value. Jürgen: Yeah. All right. If you could wave a magic wand and fix one thing about everything you have going on, what would that be? Dorie: Yeah, everything that’s going on with me personally or everything in the world? Jürgen: Yeah, with your Dorie Clark enterprises. Dorie: Yeah, I got it, because, I mean, Middle East peace, that would be good, too. Jürgen: Yeah. Yeah. Yeah. That’s right. Dorie: Yeah. I think, if I could wave a wand and fix one thing, I’ll pick another area that probably many entrepreneurs struggle with, which is, when we think about work-life balance, one of the things that has been challenging because I do spend a lot of time on the road, I’m traveling a ton, I actually marked it out, I needed to get the data recently, so I know that, in 2013, I gave 59 talks and, in 2014, I gave 61 talks. It’s more than one a week. Sometimes – a couple in a week. For a lot of these, I’m flying places for them, so it’s a pretty intensive schedule. As a result of that, I’m single. It’s very hard to meet people if you’re spending a lot of time on the road. If I was waving the magic wand, I would probably find a better way to bring someone into my life – who’s tolerant of such things and with somebody that is a good match, because it is hard sourcing candidates, so to speak, if you’re working a lot, if you’re traveling a lot. Jürgen: I’m not sure we can help with that, but, yeah, we’ll see. We’ll see how the magic wand works. Dorie: That’s right. It’s a magic wand, Jürgen. It can do amazing things. Jürgen: Yeah. Yeah, but world peace would be a good one, too. My wife, of course she got a bit of a fright when I was in the hospital – she was at work when I called and she later said, “All the people at work are all thinking of you and they’re praying for you.” I’m not religious, so I’m kind of thinking about magic wand stuff. Jürgen: I said, look, the hospital people are great. I can get better. I’ll look after myself, get them to sort out world peace or some other big problem. Dorie: That’s right. We’ll train the brain to switch on the big problems. Jürgen: That’s right. Yeah. All right. We know what you’re currently working on. We’ve talked a little bit about the book. That was a question on my script there, but I think it’s probably a good time to move on to what we do, the innovation round, where we ask about five or six questions and, hopefully, get some really inspiring one-liner quick answers from you. Jürgen: The idea there, of course, is to help our audience learn from business leaders and entrepreneurs who are leaders in their field and who’ve done some really innovative things and give them some experience from those people. Dorie: In my book, Stand Out, I actually have a section where I talk about the importance of combining disciplines, and I profile a number of different folks. One of them is a guy that I did some consulting work for named Eric Schott – who is recognized as really one of the top scientists operating in the world today. He’s written more than 200 peer-reviewed papers. He’s weighed in and had the important research and everything from Alzheimer’s to diabetes. The interesting thing is that, even though he is a biologist now, he didn’t train as a biologist. Originally, his background was in math and in computer science. What has made him distinctive is that he was one of the first people that really brought big data to bear on biology. That’s a perspective that a lot of people who were trained traditionally in biology wouldn’t have had and, in fact, didn’t have. They were pretty skeptical of him at first, but he’s been able to have huge results because of that. Training across disciplines, bringing in insights from different disciplines is something that I would really recommend as a spur to innovation and creativity. Jürgen: Yeah, that’s really great advice because I’ve seen a lot of good examples of that like the one you mentioned where people bring a completely different perspective to a field and add huge value to it that others are not able to add. Yeah. Okay, so what’s the best thing you’ve done to develop new ideas? Dorie: For me, one of the best things that I’ve done to develop new ideas, I have to say I think it’s always good to play to your strengths and to play to your interests. For me, it’s really through reading. In the early days of my business, I didn’t get an MBA. My graduate degree is in theology, but the way that I learned about business was that I was the best customer the library ever had. I, literally, just checked out hundreds and hundreds of books and was reading constantly. I mean, now, I have a lot of friends that are business authors and so tip from people who have friends that are business authors, buy the book. Don’t get it from the library. When I was young and poor and struggling, I would just check out reams of these books so that I could learn from the best thinkers. You read hundreds and hundreds of books in a subject, and you’ll get good pretty fast. Jürgen: Yes, that’s great advice, reading. Of course, these days, with the electronic gadgetry that’s around, it’s so easy to carry hundreds of books with you. You can almost have a library in your pocket, can’t you? Jürgen: I know a friend of mine, we have regular catch-ups over coffee and chat and compare notes on how we’re doing, and he always has a book with him in the backpack, a proper physical book. If he gets to the place we meet before I do, he would be sitting there reading his book. He says, “I always carry a book.” I’m more of an electronic gadget type person, so I carry my gadget with me, my tablet. I’ve got about 50 books there. The only challenge for me is that I start reading one then I jump to the next one. I’ve got about 10 half read. Dorie: That’s right. That’s right. Jumping! Jürgen: All right. What do you think is the best way to keep a project or a client on track? Dorie: A lot of people swear to certain technical solutions in terms of project management software. You’ve got Basecamp advocates and Asana advocates, things like that. Those are good, useful tools to have. I actually just wrote an article for my Forbes blog about a guy named Phil Simon, who wrote a book called Message Not Received. It’s about how business communication is getting all messed up. A point that he makes is that a lot of people use email as a project management tool, just, like, “Hey, what about this?” or, “Where are we on that?” He says that is not the way to use email. Email is going to kill you if you use it that way. You need to use a project management software if you are tracking something that is complicated, that has multiple people, that has multiple deadlines, et cetera. Jürgen: Yeah, but, I guess, that touches on that communication is really the key, isn’t it? Jürgen: Yeah, so it’s exactly what you say. It sort of gets lost and you’re actually not very efficient. All right. Now, this is a very relevant question, I guess. What do you think is the number one thing anyone can do to differentiate themselves? Dorie: Yeah, how can they stand out, in other words. Dorie: Yeah. My favorite answer to this, the thing that I think is really critical, and it has been personally very critical to me, is content creation. Basically, what I mean by this is that you can be the best thinker in the world, you can have the best ideas in your head, you can be the most insightful consultant, accountant, lawyer, Web designer or whatever it is, but, if you do not somehow put your ideas out there and communicate them to other people, no one will ever know if you’re any good. You have to start writing about them. You have to start talking about them, giving speeches, doing webinars, doing Podcasts, writing blogs. If you do that, other people, your knowledge will become manifest and they can see it and they can say, “Oh, I love the way he thinks. I’m going to hire him.” Until you do that, no one’s really ever going to know. Jürgen: There you go. I think that was just absolute gold-plated platinum! That’s such good advice. I think people tend to forget that. I keep telling people who ask, “How can we get to number one on Google?” I give an answer like that, not enunciated anywhere near as well as that, but I think I’ll have to transcribe that and copy it because I think that’s just such good advice, to get content out there and make sure people can see what is it you know and what value can you add to them. Thanks for that. That’s great. So what’s the future for Dorie Clark then? What have you got on the horizon? Dorie: Yeah. I can tell you some short term and some long term. The short term, my goals for myself this year, I want to try to get my book to be a best seller. I want to double my email list because I believe that email lists are absolutely critical. You have to have a strong opt-in email list of people, community that wants to hear from you. I also want to continue, over the next 5 to 10 years, really building my brand and building my ability to reach a large audience of people as a business speaker and writer and thinker. In about 10 years or so, looking in the longer range, I would actually like to become a university president. I’d like to find a way to be tapped to lead a prominent university. Jürgen: In the US or are you thinking going somewhere else? Dorie: Oh, I don’t know if you know any good places in Australia. I’m game for that. I can go Down Under. Jürgen: Okay. I’ll keep my eyes open. Jürgen: All right. You mentioned something about big data a little bit earlier on. One of the things that we do speak about here from time to time is the Internet of Things. What do you see as the future for big data or the Internet of Things? Dorie: Yeah, the Internet of Things is so cool and so fascinating. It has so much promise of all of our different items and appliances talking to each other. I mean, there’s smart watches and all these things are integrated up and, literally, I’m wearing today this little thing that is a souped up pedometer that clips to my belt, syncs with my phone and, here’s the interesting part, it was paid for by my health insurance company. They sent it to me to track my steps. On one hand, that might be sort of a big, broader thing because they know how lazy or not I am being. On the other hand, I don’t really care because, A, I’m an American and we don’t really care about privacy compared to the rest of the world. But, they bribed me. They actually gave me a dollar per day that I meet my step goals. They give it to me in the form an Amazon gift card every month. That’s kind of interesting. I’m impressed at the ways that companies are capturing this data and then harnessing it and nudging people in the right direction. We’re certainly going to see more of it. Wearable technology, embedded technology, things talking to each other, the snowball is growing. Dorie: Yeah, I think they’re brilliant. Let’s come back to the competition. As I said, I’m giving away a copy of Dorie’s first book, Reinventing You. Dorie can tell us a little bit more about that one in a moment. Also, I’ll ask you to tell us what you’d like the audience to do by way of commenting on the blog post after this Podcast. Dorie: Yeah, that sounds great, Jürgen. In terms of the audience’s comments, I mean I think that, one thing, you can tell me what you’re looking for, but one thing that’s always exciting is to hear people’s personal stories about how they have reinvented themselves and what that process is. I know I actually was just corresponding today with a reader of mine who has become a friend, a guy named Blair Hughes who lives in Australia. He read Reinventing You when it first came out. As a result of that, he’s taken the principles to heart, has reinvented himself. He was just emailing to tell me that he’s just gotten a 30% raise and a trip to England with his company and all of these cool things that have happened. He wanted to update me on his progress. Hearing from people about the strategies that they’ve used to make changes in their own life is something that I always like hearing about to see how people are putting the ideas into practice. Jürgen: Okay, that sounds terrific. So leave your comment underneath the video – tell us about what you’ve done to reinvent yourself, how you’ve gone about that, what your experience has been and, also, what success you’ve had. We’d love to hear that. I’ll get Dorie to swing by in a few weeks’ time and award that prize. All right. Jürgen: Yeah. Finally, what’s the number one piece of advice that you’d give to anyone who wants to be a business leader and expert in their field? What I’d like to actually stress to people is that, if you choose a niche early on and really become regarded as an expert in this small niche, you can have big benefits down road. Number one is that it’s actually much easier to establish yourself as an expert in this small thing because, if you say, “Oh, I’m an expert in sports,” that’s a really big category. There’s a lot of sports. There’s a lot of people who talk about sports. If you say, you know what, I’m going to make myself an expert in this particular cricket team or something like that, then, all of a sudden, okay, you actually stand a pretty good chance because all of the major entities, the news entities are covering the big picture topics, but people know and recognize that, because you’re focusing on one thing, you really do know more about it than other people. The other thing is that you can strategically expand your niche, because, once you start creating relationships on the basis of this niche knowledge, you start writing op eds or guest posts on blogs or you get interviewed on by a reporter or something like that, you now have that relationship. They know that you are good and articulate about this one thing and so it makes them more likely to come to you about related, adjacent areas. Maybe you start out as an expert in one cricket team. You then become an expert in cricket, and then you go from there to, okay, now, maybe you are an expert in all sports. You can’t start out there. Going deep on one narrow thing is actually a very good way to make your initial incursion. Jürgen: That’s fantastic advice. It’s so counter-intuitive to most people starting out in business, but it is absolutely critical, like you say. It was brought home to me yesterday in a way, and I thought of exactly that point, the niching, because I went to visit my doctor and, of course, I needed to go and see an orthopedic specialist for the follow-up on the injuries that I’ve got. Of course to get to see an orthopedic specialist I need a referral from my GP doctor. The specialist is in such high demand that I’ve got to go through this process to see them and I’ve got to pay a lot of money then to see them and so on. When I spoke to my doctor, he said, “We can’t get just any orthopedic specialists because they specialize in different things. Some of them will do hips. Some of them will do shoulders. Some of them will do elbows. We’ve got to find the right one for you.” I thought, wow, that’s even more detailed specialization than I was aware of. Jürgen: Yeah, and then, of course, when he rang the guy who, I needed a shoulder specialist orthopedic surgeon, he rang the clinic and they said, “we can’t see you for ages.” It’s actually a very difficult process to get in there because this person is in such high demand. Dorie: That’s a great story. That’s perfect, Jürgen, yeah, absolutely. If it works for medical doctors, it can work for you. Jürgen: That’s right. It should work for everybody. All right, this has really been great, Dorie. I really appreciate your spending time with us today. Where can people reach out to you and thank you for all the information you’ve shared with us today? Dorie: Thank you very much. On my website, which is dorieclark.com, I actually have more than 400 free articles that people can access. There’s a lot of information for people that are interested in personal branding or professional reinvention. In fact, I have an email list that people can sign up for. They can go to dorieclark.com/join, and they can actually get a copy, a free copy, of the Reinventing You Self-Assessment, which has been one of the most popular parts of the book. Whenever I get feedback from people, that’s usually one of the top things that people say, “I love that self-assessment.” You can get a free copy of it off of my website. I’m on Twitter @dorieclark, so people can feel free to connect with me there. Jürgen: Okay. Thanks, Dorie. We’ll put links to all of those things underneath the show notes for the episode, obviously, and also links to the books on Amazon so that people can go and buy the books and read the books. Okay. Jürgen: Finally, then, Dorie, who do you think I should interview next on the Podcast and why? Dorie: Oh, I’m going to suggest my friend Judy Robinett. Have you talked to her yet, Jürgen? Jürgen: No, I haven’t. No. Dorie: I think you’ll like her a lot. She is an author of a book called How to Become a Power Connector. She is a networking maven, a great person who really practices what she preaches. She has an interesting and insightful view about how to build your professional relationships in a way that pays dividends for you and for the other person. I think that she would lend some great insights to your show. If you would like an introduction? Jürgen: Yeah, I’d love that. That’s Judy? Dorie: I can do an email intro for you. Jürgen: Yeah. Okay. That would be great. Judy, look out. If you’re watching this, look out for an invitation to the InnovaBuzz Podcast from me. Look forward to that. Thanks very much, Dorie. It’s been an absolute pleasure to have you on. It’s been a fascinating interview and discussion. I really look forward to getting back to reading the Reinventing You book. I also look forward to, in mid-April, getting a hold of the Stand Out book. Thanks very much for being on the Podcast. Dorie: Jürgen, thank you so much. Great to talk with you. I hope you enjoyed meeting Dorie as much as I enjoyed interviewing her on the podcast. It was great fun and the key messages I took out of that interview were firstly publish and get your ideas “out there”, secondly leverage your capabilities and thirdly focus on your niche. All the show notes for this episode will be at innovabiz.com.au/dorieclark, that is D-O-R-I-E-C-L-A-R-K, all lowercase, all one word, innovabiz.com.au/dorieclark for all of the links and everything we spoke about in this episode. Remember, leave your comments underneath the video for your chance to win a copy of Reinventing You, by Dorie. Leave your comment underneath the video and tell us about what you’ve done to reinvent yourself, how you’ve gone about that, what your experience has been and, also, what success you’ve had. We’d love to hear that. I’ll get Dorie to swing by in a few weeks’ time and award that prize. Dorie suggested I interview networking maven and author Judy Robinett on a future podcast. Judy, we’d love to have you on the InnovaBuzz podcast, courtesy of Dorie Clark, so keep an eye on your Inbox for an invitation from me! If you like these podcast episodes, head over to iTunes and give us a five star review. It really does help to get more listeners and to share this information with a bigger audience. And I really do want to share these gems, that people so generously share with us on the podcast with as many people as I can. Of course, if you think there are opportunities for us to improve the podcast, please let us know.